Cryptopay FAQ: how to buy bitcoins? what is crypto card? etc - How do I get a C.Pay card? All Categories › C.Pay Prepaid Card › How do I get a C.Pay card? The C.Pay card is a prepaid card linked to your Cryptopay Bitcoin wallet. You can order a USD, RUB or EUR (coming soon) card. Check out your information and choose the payment method: BTC transfer or payment using funds in your account. 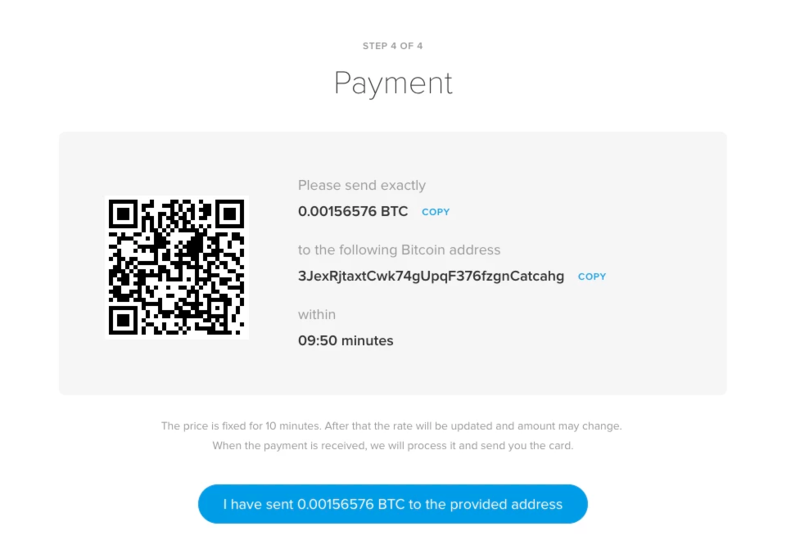 If you’ve chosen to pay using BTC transfer just send funds to the address you’ll be given in the invoice. It looks like this. Please note: the invoice is only valid for a limited time (10 minutes max). You should pay as soon as possible after you order the card. Once you pay you will see this message in your account. Our card issuer will contact you shortly to arrange the delivery. How do I pay for my C.Pay card? How do I withdraw CPAY from Cryptopay?